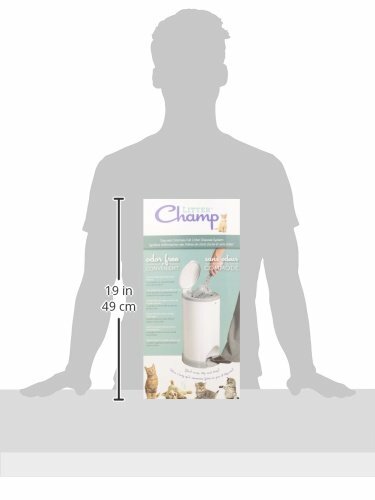 The Lucky Champ Litter Champ in taupe color is a more budget cat litter disposal system that still comes with a lot of quality for your money. 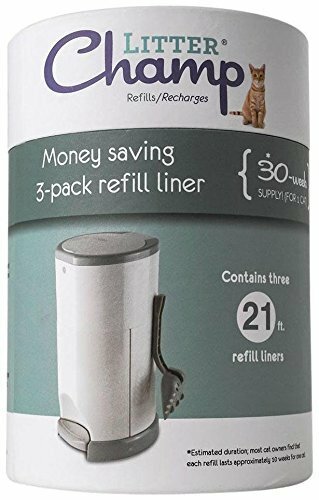 While being much cheaper than the bigger brands such as the Litter Locker II and the Litter Genie Plus, the Litter Champ is still having a strong position with a good quality product at an extremely nice low price. The Lucky Champ Litter Champ in Taupe color is a cat litter disposal system for people that don’t want to take a trip to the garbage container every time that they scoop the litter box. The Litter Champ stores the litter box produce in a way that we won’t smell it in the whole house. Your cat does its business on the cat litter box (cat toilet). Your cat requires the litter box to be clean at all times, so you take out a bag and scoop away all the dirty litter you can find. Now you got an open bag of stinking cat litter in your hands. What will you do with that? Will you knot it up and drop it in the garbage container in your house? 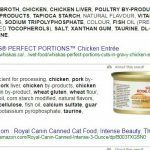 This might stink through your kitchen every time you open the container. Do you take it outside to the garbage container that gets collected every (other) week? That’s fine if the container is nearby, indoors or when the weather is great. What about the snowy season or the rainy season? As soon as you got back from wherever you delivered the cat litter you return to the litter box, only to find the next produce of dirty cat litter. A litter pail such as the Litter Champ stores all the cat litter until it is full. It will solve the problem of having to waste several bags for scooping cat litter. It will also save you from having to go to an outdoor container after every cleaning job you do on the litter box. After testing the Litter Genie and the Litter Locker II litter disposal systems, it was time to test another great litter disposal system. The Litter Champ is different from the other systems in that it is way simpler built, has a bigger container and is way cheaper. Even the bag cartridges that you need to replace over time, are way cheaper than the bigger branded products. Even though the Litter Champ litter disposal system is way simpler built, it is surprisingly one of the strongest systems out there and it still keeps away the smells we all dislike. It is essential to use the right type of cat litter for this device. Clumping cat litter will give you an advantage on how often you need to take the full bag/liner out, because you will be scooping less dirty cat litter away. 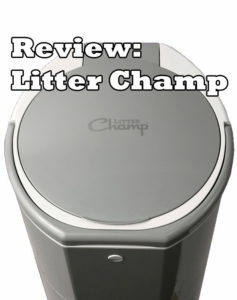 For us the Litter Champ Litter Pail by Lucky Champ has been a great solution to scoop and store dirty litter. We no longer have to walk to the garbage container outside every time we clean the litter box. We got a large cat family with both our own cats and that of the animal protection that produce together a lot of cat litter. We manage with our 9 cats to store up to 1 month of cat litter in the litter pail. A one-cat household will easily quadruple the time before you need to take out the litter. The Litter Champ offers a lot of convenient storage of cat litter with a good locking mechanism and large bags. It is very convenient to scoop away cat litter without using more hands than necessary. The free scoop is also a joy for our scooping use, as it works surprisingly well for our litter. While there are reports of the second top lid to be flimsy, we haven't experienced the same problem yet, but are then also very careful with the device. We feel it is extremely handy that we can carry the Litter Champ around in the house by the handle between the many litter boxes we need to clean everyday. The only negative I can say about this product is that it isn't really locking litter away when you open the litter pail to add more scoopfuls of dirty cat litter. Other litter pails have better system designs for that. Nonetheless is the price of both the litter pail and the refill cartridges way lower than that of the other branded products on the market and therefore I really suggest you to give Litter Champ a try! The Litter Champ is much bigger than the other litter pails out there with 10 7/8″ x 16 1/2″ x 4 3/4″ (275mm x 420mm x 120mm). The inside of the pail gives room to a large 15 liter (4gal) container for storing away the stinking used cat litter. The container is built around the concept of being convenient in every way possible. If you happen to have multiple cat litter boxes in your house, you can easily use the same Litter Champ to scoop all litter boxes clean. For a one cat household this litter pail can easily store cat litter for more than 4 months. We surely don’t make the 3-5 months with a 15 liter bag, but still manage an entire month of dirty cat litter storage at a total of 9 cats (as of today). The refill cartridges contain a liner that lines the container with an 18 micron thick bag. The bags are not ready-made, but instead a long line of bag material that you cut and knot up in the bottom. You knot them in the top when you dispose of them again later. The liner is partly made with recyclable material but is still durable and tear-resistant. The refill cartridges with the liner for the container are much lower in price and are 30% longer than the other refill liners at 20 foot in length. That is a lot of storage of cat litter for little money. Usually these refill cartridges are sold at special saver deals with badges of 3 or more at stores too. For some people the low-cost refill cartridges have not been cheap enough. They say that you can however use the empty liner cartridge to put a normal garbage bag around it and into the litter pail. That is a handy tip for those who want to use their own cheap litter bags for this litter pail. The Litter Champ comes with a double lid locking mechanism to lock smells away. The first part is the lid that lifts upwards when you press the pedal on the bottom of the container with your foot. This lid has a seal all around to close off the litter pail from smells. When you open the top lid with the pedal, the second lid is revealed. It has a dial to lock the lid in place, which needs to be dialed open before use. This lid flips open every time you empty the scoop into it. In this way you can conveniently clean the litter box without ever having to touch lids or cat litter. Unfortunately there have been reports that the second lid is also prone to break down quickly. Mine has not broken yet, but I am extremely careful with the device while knowing about the flunk. As an extra solution instead of using just the scoop to open this second lid, you could use your free hand to open it and keep it open during your entire scooping session. Cleaning the litter box has never been so easy! The Litter pail comes with a free scoop that can conveniently hang on a hook of the side of the litter pail. The scoop is exactly the size of the opening of the second lid, so that you can push the lid easily open with the scoop when emptying the scoop. The Litter Champ also comes with a carrying handle on the top that folds nicely in place. Have you got several litter boxes that need cleaning? Not a problem at all. No longer is there the need to carry the container around from the sides or bottom. No longer the chance that it will open up or dirty litter will fall out for you can simply grab it by the handle and carry it around. 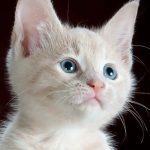 This has been a bless for us as we got foster cats living in the bathroom with their own litter box and several other cat litter boxes for our big cat family all around the house. Once the liner is full of disposed cat litter, it is very easy to remove the liner from the litter pail. The liner can be easily removed from the container and a knife on the inside helps you to get the job efficiently and fast done. With a simple swipe of a button on the left-side, the pail opens on the front. Inside you remove the bag with two hands. You pull out some new ’empty’ liner from the cartridge. Inside the door is a knife to cut the liner in two. Make sure you have enough liner on the top of the full bag so that you can knot it shut. The litter pail ‘fresh’ from the box upon arrival should come with a refill cartridge pre-installed. They have also knotted the liner on the bottom, but to be sure you can check that out. You open the litter pail on the slider slightly on the left of the front-side. Pushing it down opens the locking mechanism. Check if the liner is in there and has a knot in the bottom. Have the Litter Champ next to your litter box. This makes it easier to prevent spilling of cat litter between cat litter box and litter pail. Take the grey scoop that comes with the litter pail. When you just got your litter pail it might be inside the litter pail, but it should be placed and hanging on the right-hand side of your litter pail. Use one of your feet to press the foot-pedal down to open the top-lock. Dial the dial of the second lock into the open-position. Scoop dirty cat litter clumbs from your litter box and dispose of them inside the litter pail. The scoop that comes with the litter pail fits exactly on the opening of the second top-lock. You need to push the scoop down into the lock to open it and let the dirty cat litter drop down into the liner. When you are finished, dial the locking dial on the second lock to the closed position and then close the top-lock by letting go of the foot-pedal. The liners should last quite some time, but it depends greatly on the amount of cats and the dirty cat litter they produce. As soon as you have filled up the liner with dirty cat litter, it is time to take out the garbage to the container and line the pail with a new liner. You will find that your pail is properly filled up when you are unable to open/close the second top-lock. Open the pail with the little slide button on the left-hand side at the front of the pail. The door will now open at the front. Take the bag carefully out of the pail. Cut the liner with enough room to make a knot. There is a knife on the inside of the door. Make a knot in the new liner and pull it a little down. Close the pail. Happy scooping! Q: The product comes with one refill cartridge, how long will this last? A: I see where the confusion comes in. Some people report the refill cartridge as a bag and some people report a single load of the liner as a bag. A cartridge could theoretically last you between 1 month and several months. A bag could last anywhere between 1 week and a month or two. It will come down to how many litter boxes and cats you got and whether they go outdoors or are solely indoor cats. Our cats are both indoors and outdoors. In winter, they are more indoors than outdoors and generally do use the litter box more often. In summer, spring and autumn they are more often outdoors and don’t use the litter boxes as often. This means that we manage about one month on a single lining bag for about a month. Solely indoor cats would probably fill the lining bag up in a week’s time. A cartridge would probably last about a month or a little more. 9 adult indoor cats would use probably much more than our 6 adult cats and 3 kittens are producing right now. Q: Can you carry this unit around, is it heavy? A: Depending on which litter you use, the container might be heavy or light. The unit itself is pretty light, even when it is full of litter. With an organic based litter it will be lighter than with clay based litters. The older model of the unit didn’t come with a carry around handle, but the newer model that is currently on sale in most shops does come with a convenient carrying handle. Carrying the Litter Champ around was never this easy. For us the Litter Champ Litter Pail by Lucky Champ has been a great solution to scoop and store dirty litter. We no longer have to walk to the garbage container outside every time we clean the litter box. We got a large cat family with both our own cats and that of the animal protection that produce together a lot of cat litter. We manage with our 9 cats to store up to 1 month of cat litter in the litter pail. A one-cat household will easily quadruple the time before you need to take out the litter. The Litter Champ offers a lot of convenient storage of cat litter with a good locking mechanism and large bags. It is very convenient to scoop away cat litter without using more hands than necessary. The free scoop is also a joy for our scooping use, as it works surprisingly well for our litter. While there are reports of the second top lid to be flimsy, we haven’t experienced the same problem yet, but are then also very careful with the device. We feel it is extremely handy that we can carry the Litter Champ around in the house by the handle between the many litter boxes we need to clean everyday. The only negative I can say about this product is that it isn’t really locking litter away when you open the litter pail to add more scoopfuls of dirty cat litter. Other litter pails have better system designs for that. Nonetheless is the price of both the litter pail and the refill cartridges way lower than that of the other branded products on the market and therefore I really suggest you to give Litter Champ a try!